Hello friends, hope you all are fine and enjoying good health. Today I am posting the next part of Proteus tutorial which is Interfacing of LCD with PIC Microcontroller. . In the previous post of this tutorial, we have seen the basics of Proteus and discussed various functions of Proteus ISIS. If you are new to Proteus then I would recommend that before starting this tutorial, you should first read the first part so that you get the better idea of Proteus as I wont go in detail in today’s post. 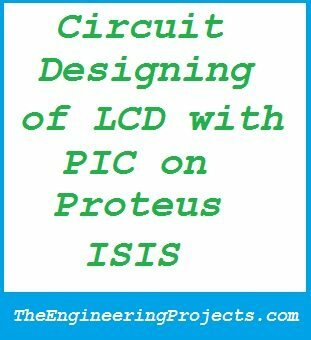 Today, we will first design a circuit of LCD with PIC on Proteus ISIS which includes PIC Microcontroller and then we will see how to burn the microcontroller in Proteus and at the end we will run our circuit and will display some text on the LCD. It will be quite a fun so let’s start. If anyone having any problem at any point, ask in comments and I will try my best to resolve them. So, let’s get started with Interfacing of LCD with PIC Microcontroller. First of all, open the Proteus ISIS software. In the start, it will look exactly the same as in below image. Now click on button P as shown in below figure. When you click this button a new window will pop up as shown in below figure. This is the place where we search our components, like as I want 7805 so I searched for this component and the Proteus has given me the related components. 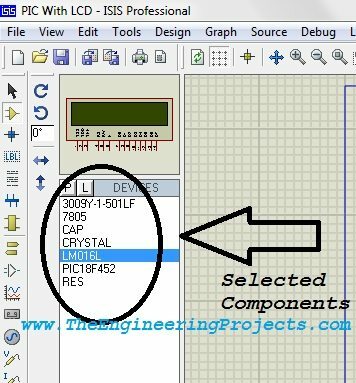 Once you get your desired component, simply double click on it and it will be added in your database so that you can use them. Now place these components in the Proteus workspace and connect them. 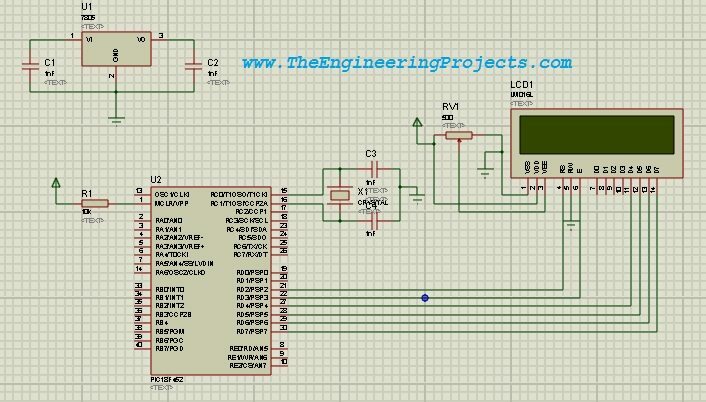 Design exactly the same circuit as shown in the below figure for interfacing of LCD with PIC Microcontroller. Now our circuit in Proteus is ready to use, the next step is to write a code for the PIC Microcontroller 18F452 and then burn it into the Proteus and check its working. There are different compilers to write the code for PIC Microcontroller. Here I am using MikroC Pro for PIC. You can get it easily from the official site of MikroC. I am not going in the details of coding as its beyond the scope of this tutorial, but still I am posting the code. 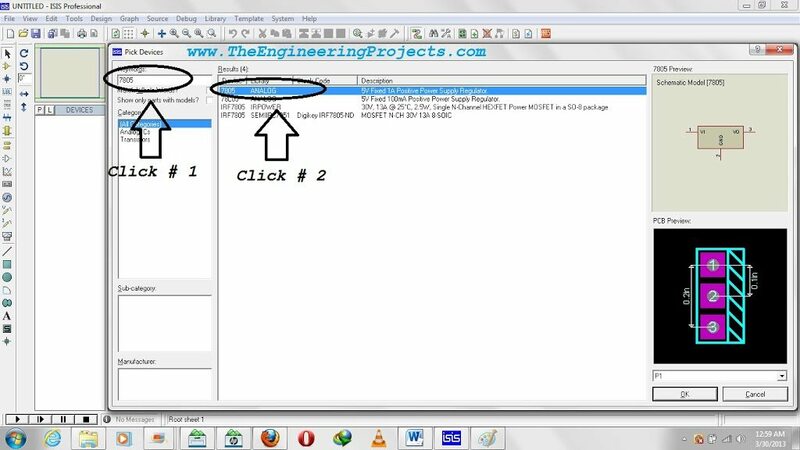 So now create a new project in the MikroC Pro For PIC and copy the below code and paste it in the project and compile. 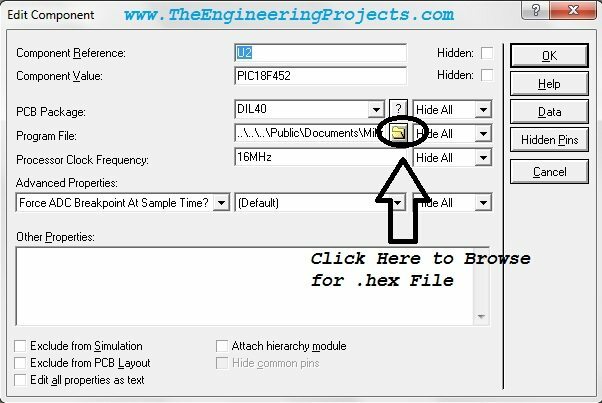 When you compile the project, it will create a .hex file in the same folder where you have saved this project. We will use this hex file shortly. Now we have the hex file, we need to burn this hex file in the microcontroller in Proteus. So, double click on the Microcontroller in Proteus and it will open up the properties menu of PIC microcontroller. Now click, as shown in the below figure, and browse for the hex file and click OK.
We need to add this hex file in Proteus here and also select the oscillation frequency which I have selected 16MHz. Note: Make sure that the oscillation frequency remain same both in the MikroC and the Proteus. After adding the file in the Proteus now click OK and play the simulation, ifeverything goes fine, you will get the results as shown in below image. Proteus ISIS simulation file and the .hex file has been emailed to all the subscribed members. If anyone need it, subscribe to our newsletter via email and it will be emailed to you as well. That’s all for today, I have tried my best to explain everything on Interfacing of LCD with PIC Microcontroller, but still if someone having problem ask in comments and I will try to resolve. In the next part, we will discuss various components of Proteus which are commonly used like motors, serial port, hyper terminal etc. So stay tuned and also subscribe us via email so that you get all the tutorials straight into your mail box. Have fun. Take care. im so apperiate. looking forward to hear from you soon. Can’t we remove “text” in each component? I want to print the circuit i have in proteus. But it looks odd with these unnecessary text. yeah you can easily remove the text ….. open the properties and remove the name of the component ….. just clear it and click OK. I followed ur all instructions bt nothing is displayed on LCD.can u tell me where i am doing mistake?? you must be doing some mistake somewhere, Let me know what problem you are facing and does the copy the same code ??? nothing is displayed…here’s are d errors…plz help..
Am new to the PIC stuffs…does the code u wrote on mikroC pro for PIC run on mikroC for PIC…what is the difference between the two? 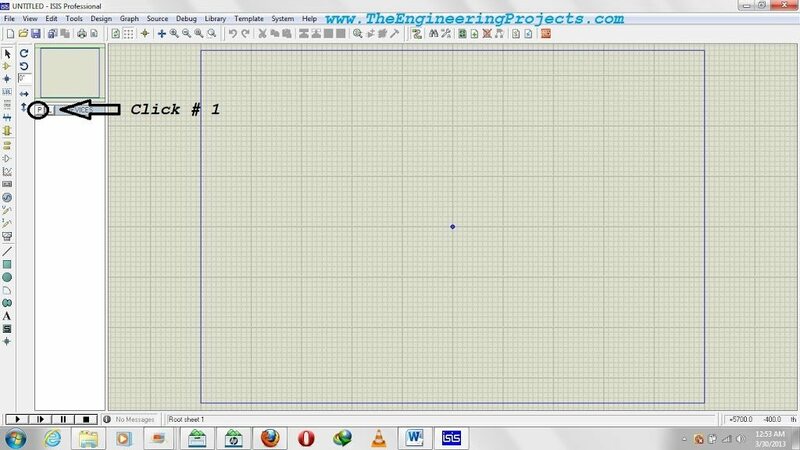 i want to write the name of circuit on the pcb but there is ground area probem. 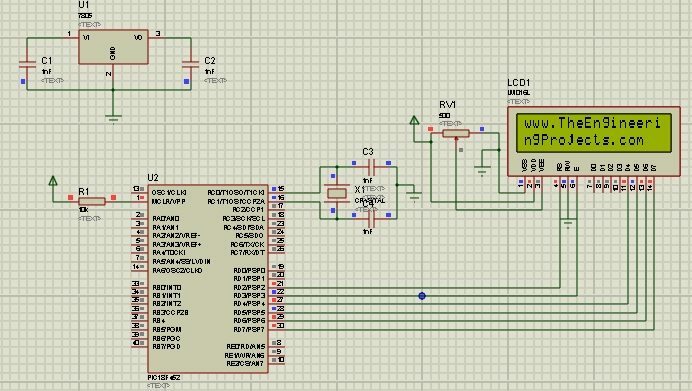 How to remove particulr ground area for write the name of circuit on ares. I have done the Domitian of LCD using ARM7 nd I didn’t connect crystall and reset to it ..Then how does the circuit simulate? If I want to connect crystal nd reset den what changes should I made in coding? If possible can you please send me the hex and c flie. AOA,realy u r doing an excellent and effortless work for others which is i think SADQA JARIA,God bless u all. I wanna ask that how arrows indicating current/signals directions are created in interactive simulation,Example lies in open samples (interactive simulation),Regards. Regarding your question, there are different ways to show current or voltage, you can find current/voltage probes in the left toolbar, place that probe on any point and you will get the voltage or current at that point depending which probe you are using. Moreover, you can also use Oscilloscope in Proteus and can check your current or voltage curve there. I have posted a tutorial on How to use Oscilloscope in Proteus, which can help you a lot. I need of helps with a work about Protheus. I can to pay if is all OK. Send me a E-mail that we can to speak better. I’m a Brazilian student of electrical engineering. Thank you! this type of error occur in my coding i need immediate attention you.